You can share an Oracle Eloqua integrated form, hosted on your external website, across multiple Oracle Eloqua campaigns. Reusing general forms, where applicable, helps to quickly generate responses across one or more campaigns. Double-click Form under Assets in the left menu. A new form element appears on the campaign canvas. 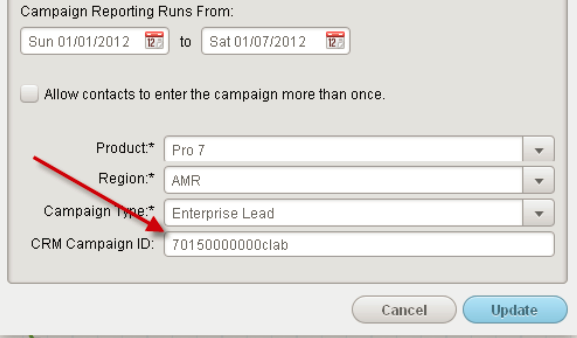 Copy the campaign id value from the URL (in this example, 19) while in the Oracle Eloqua Campaign Canvas. Note: Save your campaign before copying the campaign ID from the URL. This number must be a positive integer. Go into the HTML source code of your external website where the Oracle Eloqua integrated form is hosted, and include the hidden HTML form field as shown below. Your externally-hosted form is integrated into your campaign. Repeat this process for each form on your website and for each Oracle Eloqua campaign using the form. The campaign ID ensures that a form submission on campaign A will be associated only with campaign A, and not with campaign B, campaign C, and so on.